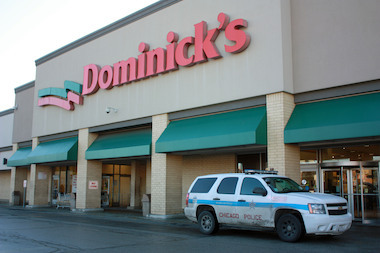 The South Shore Dominick's, 2101 E. 71st St., went out of business at noon on Dec. 28. SOUTH SHORE — The city on Tuesday said it will seek to take over Jeffery Plaza by eminent domain, but the owners of the property that houses the former South Shore Dominick’s vowed to fight the move. The city is requesting the authority to take over the shopping center at 71st Street and Jeffery at the Community Development Commission's Oct. 14 meeting, an agenda released Tuesday states. The city would still need approval from the full City Council and the courts. The move to acquire the land, a source said, is part of an effort to encourage the owners of the property to move more aggressively to fill the grocery store that has been vacant since Dominick’s left on Dec. 28. But George Gamel, controller and portfolio manager at Cannon Commercial, the owner of the shopping center, was upset by the announcement. “This is not something the owner is going to take lying down,” said Gamel. He said the company has worked with the city for 10 months on finding a new tenant for the space, but he said Ald. Leslie Hairston (5th) and the Mayor’s Office have not returned his calls since he heard the city might try to acquire the site. “Myself and my owner are very upset that we have not gotten return phone calls from Ald. Hairston,” Gamel said. Hairston has declined to confirm that eminent domain is being considered, but said Monday that new tactics for providing a grocer for the neighborhood should be considered. In March, she said the owner had offered to sell the shopping center for $27 million, although on Monday Canon said the land was not for sale. Community groups working on finding a new tenant were hesitant to say whether they thought eminent domain would speed up the process of finding a tenant. They noted that the process of taking over private land by a public body can take a long time. “It’s nice to hear, but unless it happens anytime soon, it’s just nice to hear,” said Val Free, director of the Planning Coalition. Gamel said Cannon Commercial would continue to seek a tenant for the space until it receives a response from the alderman or the mayor. Officials with the mayor did not respond to requests for comment.